The final weekend of the Virginia Mason Challenge Cup and Virginia Mason Washington Youth Soccer State Championships — featuring the high school girls age groups — always draw the most talented female soccer players from across the state to Starfire Sports. This year, they drew the most talented who has ever played the game. 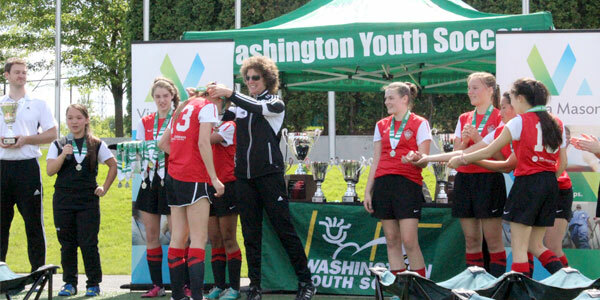 Washington Youth Soccer alum and FIFA Player of the Century Michelle Akers was the guest of honor on the final weekend of State Cup play, signing autographs around town, hosting a free clinic along with Seattle Sounders Women players, and presenting champions and finalists with their awards on Sunday evening. Born in Southern California but raised in North Seattle, Akers rose to fame as a teenager, winning numerous Washington Youth Soccer State Championships, two US Youth Soccer Region IV Championships and finishing runner-up twice at the US Youth Soccer National Championships. A Washington Youth Soccer Olympic Development Program member, Akers also set the state high-school scoring record and earned prep All-America honors. After a four-year collegiate career at Central Florida, Akers embarked on what can only be called the greatest international career by any player — male or female — to ever put on the red, white and blue. Akers' first international goal was the first in U.S. Women's National Team history, tallied by a 19-year-old Akers chosen to the U.S. squad by fellow Washington Youth Soccer legend Mike Ryan, who coached the U.S. women in their first tournament in 1985. She'd go on to score 105 goals in just 153 games for the U.S. Women's National Team, a rate unmatched by any other U.S. player with as many career scores, while adding World Cup titles in 1991 (a tournament in which she won the Golden Boot by scoring 10 times in just six games) and 1999, and an Olympic gold medal in 1996. Akers was named FIFA's Player of the Century in 2002, and in 2004, no less a soccer authority than Pele himself named Akers to his list of the 125 greatest living soccer players in the world, one of just two women — along with Mia Hamm — so honored. Interestingly, Akers said that it's the little moments she remembers most — finding her parents in the stands at the Rose Bowl in 1999, as the fans in attendance at the World Cup Final chanted her name; the emotional rush of relief and excitement that came over her when she scored the winning goal with two minutes left in the 1991 World Cup, and the caution she felt while encouraging her teammates in the center circle to maintain their focus and finish strong. When she met with players throughout the weekend at Schmetzer's Sporthaus and Starfire Sports, and looked out at the faces of the 100 U10-U16 girls who attended the clinic on Saturday, Akers spoke to them about the importance of preparing themselves to play tough — not just physically, but mentally.